A Canadian man who used to live on the street has donated C$10,000 ($7,400, £5,720) to the homeless shelter that took him in. 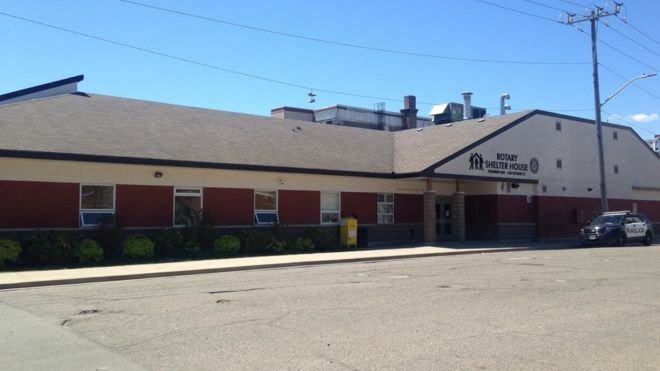 Thunder Bay’s Shelter House was struggling to keep its street outreach programme running. The man, who is a residential school survivor, donated the money to help his friends “stay safe”. Since his anonymous donation made the news, people from across Canada and the US have donated to the shelter. Staff member Alexandra Calderon told the BBC the man has been coming to the shelter for about five years. Although he is no longer homeless, the man is not wealthy and appeared at the shelter with a support worker. He still uses some of the shelter’s services. “He was adamant that he wanted to make the donation, because of course my first reaction was he should keep this and use it for other things,” she said. The man, who wishes to remain anonymous, got the idea after he heard the shelter would be shutting down its SOS street outreach programme, which picks up homeless and other at-risk people and brings them to the shelter, hospital or detox clinic. The programme was only partially funded, and Shelter House said it would have to raise $200,000 if it wanted to keep the programme running all year long. The man was in the shelter’s lobby when a representative from Matawa First Nations donated $10,000 to the shelter and challenged others to give too. He decided to donated his money from a government settlement for residential school survivors. Thousands of indigenous children were forced to attend church-run boarding schools, where they were forbidden from practicing their culture and were often abused. The last school closed in 1996. The man said he wanted to use the money to make sure his friends could “get around the city and stay safe”. Ms Calderon said that when he explained why he wanted to donate, they both started to cry. “He was just so happy, and so grateful that we were happy,” she said. His gift has inspired others as well. People from across North America have donated about $15,000 towards the shelter since Sunday, when his donation was made public. Ms Calderon says they are about halfway through their $200,000 funding drive now.